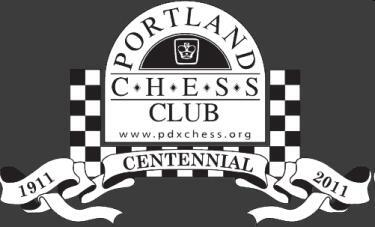 Celebrating its 100th anniversary this year, the Portland Chess Club is one of the oldest living chess clubs in the US. Festivities at the Lloyd Center Hilton Doubletree Hotel August 12-14 included a three-day chess tournament, a 14-round blitz tournament, and a 10-board simul with Susan Polgar, former Women’s World Champion and first female grandmaster. Overall 180 players participated, including 22 Oregon scholastic players. 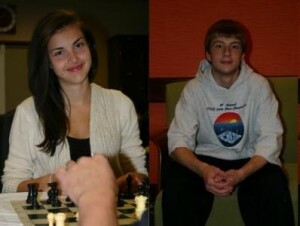 Alexandra Botez (Clackamas) and Calvin Parnon (Corvallis) played in the championship section. The section ended with a four-way tie for first at 5/6, including IM Georgi Orlov (2541), FM Bindi Cheng, FM Nick Raptis, and Loren Laceste. Alexandra scored an impressive 3/6, tying with National Master and two-time defending Oregon champion Radu Roua (and winner or co-winner four of the past five years) and several other players. Calvin was one of a handful of brave souls rated below 2000 who elected to play in the championship section. His play has improved tremendously the past two years by virtue of his hard work and his custom of always seeking out the strongest competition he can find. He played well and got a strong advantage in several of his games but had trouble converting his advantages to wins — a good tournament and frustratingly close to a great result. Expect to see Calvin at the top of the cross tables in strong tournaments in the not-too-distant future. Of the 20 Oregon scholastic scholastic players in the U2000 section, Matt Dalthorp (Corvallis) scored the highest with 4.5/6, tying for sixth overall and winning the ﻿1st place U1800 prize ($500). Maxwell Sun (Corvallis) and Steven Witt (Hillsboro) scored 4/6 in a 16-way tie for 16th-32nd place and a four-way tie for 2nd-5th among U1800s, winning $125 each. Collin Goldman (Eagle Point) and Dhruva Chatterjee (Wilsonville) finished at 3.5/6, with Dhruva tying for third among U1600 players. David Wen (Corvallis), Austin Nguyen (Portland), Dillon Murray (Gresham), and Nathan Jewell (Portland) scored 3/6. Nathan’s result was particularly notable. Of the 68 players scoring 3 or better, he was the lowest-rated by over 200 points! A number of Oregon scholastic players also played in the blitz tournament on Saturday between rounds of the Centennial Open: Collin Goldman, Gabe Skoro, Austin Nguyen, Clemen Deng, Matt Dalthorp, and Leo Deng. Full results here.